Our 4” Ultimate System provides less lift than our 6” RTS™ system but still allows use of 33” or 35” tall tires with cutting for street and offroad use. 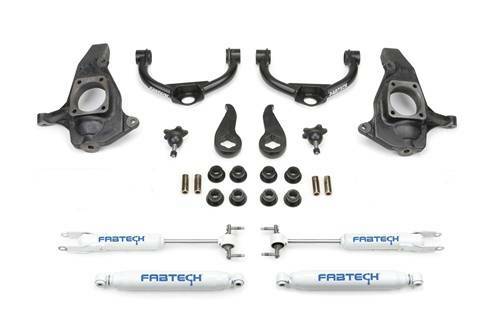 We have developed this system utilizing replacement upper control arms constructed of 1.50” OD .120” thick wall DOM tubing that attaches to heavy duty Fabtech ductile iron steering knuckles. The factory torsion bars remain in the stock position and use new forged adjusting keys to provide the proper amount of lift.